The world already knows Meg and Charles Wallace Murry, Calvin O'Keefe, and the three Mrs--Who, Whatsit, and Which--the memorable and wonderful characters who fight off a dark force and save our universe in the Newbery award-winning classic A Wrinkle in Time. But in 50 years of publication, the book has never been illustrated. Now, Hope Larson takes the classic story to a new level with her vividly imagined interpretations of tessering and favorite characters like the Happy Medium and Aunt Beast. Perfect for old fans and winning over new ones, this graphic novel adaptation is a must-read. This is a hard one for me to review. Really hard. A Wrinkle in Time is one of my all-time favorite books. I re-read it once a year. Charles Wallace, Meg, and Calvin are three of my favorite fictional characters. Their journey is so ingrained in my imagination that to see someone else's vision, especially an illustrator's, is almost impossible. All that being said, I'll do my best to write this here review. The adapter and illustrator, Hope Larson, does an excellent job maintaining the integrity of the story. While depth and characterization are sacrificed a bit in this format, she excels at highlighting the important themes of faith, freewill, and love that are at the core of the Murry family's journey. My biggest problem with this version comes down to personal tastes. I wasn't a huge fan of the illustrations. I'm finding that I'm pretty particular on graphic novel artwork, and for some really unexplainable reason, this wasn't my favorite. Again, it probably has a lot to do with my own imagination, plus, the shadow is easier to explain than illustrate, and the mysterious guides -- Mrs. Who, Mrs. Whatsit, and Mrs. Which -- came off overly harsh a few times. So there it is. 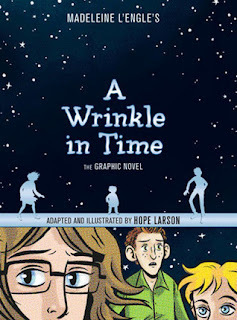 Hope Larson's adaptation of A Wrinkle in Time is worth reading. Pair it with an enjoyable reading of Madeline L'Engle's classic story and you're in for a good time.